Couldn't apply datablock '[Value 0x00000001]' to this renderable. Using default one. Check previous log messages to see if there's more information. Edit: If I click "Apply current material to (sub)mesh." nothing happens. Edit2: I think I'm getting somewhere. I don't think the problem is in HLMS Editor. I think the problem is that I didn't correctly link some of the plugins while compiling. Edit3: Things are starting to work. Still have some problems I haven't been able to figure out today. The first one is that changing the mesh from the 3d viewport right click menu doesn't actually change the mesh. The second problem I have is that using the same menu to change the skybox doesn't change it either. MovableObjectFactory for type 'Item' registered. MovableObjectFactory for type 'ManualObject2' registered. MovableObjectFactory for type 'WireAabb' registered. DefaultWorkQueue('Root') initialising on thread main. OpenGL:performance(medium) 17: CPU mapping a busy "bufferobj" BO stalled and took 8.828 ms.
OpenGL:performance(medium) 17: CPU mapping a busy "bufferobj" BO stalled and took 0.691 ms.
OpenGL:performance(medium) 17: CPU mapping a busy "bufferobj" BO stalled and took 0.171 ms.
OpenGL:performance(medium) 17: CPU mapping a busy "bufferobj" BO stalled and took 0.047 ms.
OpenGL:performance(medium) 17: CPU mapping a busy "bufferobj" BO stalled and took 0.012 ms. So I think the problem is that for some reason an ampersand is prepended to each action text. I'm not sure if it is the cleanest fix, but now it works for me on Linux. Edit: I like this project and I'm interested in improving my programming skills. So maybe once everything works nicely for me on Linux I could try to help you out with some of the issues. For those who got it working in Linux, any advice? 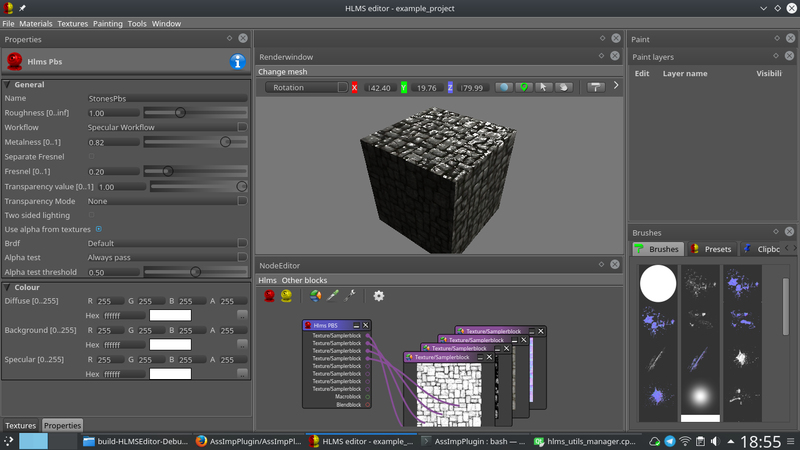 Update of the HLMS Editor. I've added a gLTF import plugin. It is not the fastest importer (be patient with big models), but it pretty much loads all gLTF models (both .gltf and .glb) and supports the KHR_MaterialsPbrSpecularGlossiness extension. See my signature for download of the latest version. Hey, nice to see that! Thanks for this. Just downloaded, installed and ran. I'm getting into 2.1 so looking forward to playing around. Having an issue with mirrored UVs and normal maps. The normal map is being flipped on the half of the geometry with the flipped UVs. Is this an issue with the HLMS editor or Ogre? I had tried that. Flipping the green channel just switches which side is messed up. I've also tried baking in different programs with no luck. Looking at some other threads this appears to be an issue with Ogre and mirrored UVs that is solved by storing a parity in the .mesh file? I don't see a way to do that in HLMS Editor since I'm using a .obj. Sounds like the mesh is being imported (by hlms editor?) Without bitangents nor the bitangents' flipping sign. Or that information is somehow lost. Would this be the same thing as binormals? I tried to export the model using the 3ds max "game exporter" which has a checkbox for "tangents and binormals". Didn't fix the issue though. So maybe this information is being lost? Just a heads up I am not a dev, just a lowly artist lol. I saw in an earlier post some example materials but the link is no longer valid. Is there an archive or share of materials that we can use and play around with? Thanks for the link. I'm learning how to use the editor and making some progress. Is there a way for presets to load automatically. I was able to create one and I think it was saved with the project. For instance the presets you put in the file how best to get access to them?